ONE CALL. ONE COMPANY. ONE GREAT GOLF EVENT. Since 1994, GolfTournament.com has been a top nationwide provider of custom logo golf products for events of all sizes and purposes. From charity fundraisers to company outings, GolfTournament.com will closely and professionally assist you every step of the way. Our goal is to provide you with every item required to make each phase of your event a success. We are family-owned and operated with a sincere commitment to providing high quality products at a fair price. Each member of our customer service team plays golf, talks golf and is passionate about the fundraising opportunities involved in the tournament planning process. 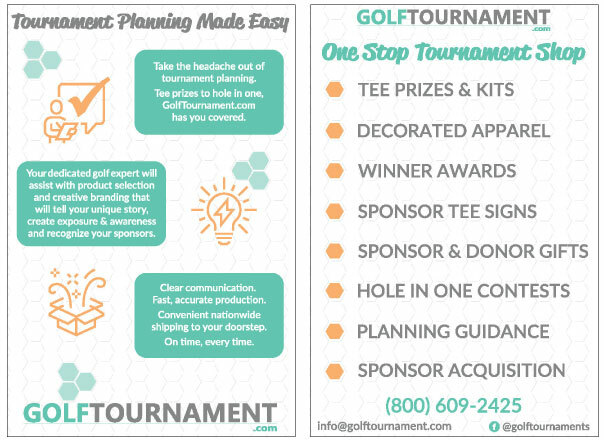 Call (800) 609-2425 or email us at info@golftournament.com to learn more.